Mannheim. In the end, you can't help being absolutely fascinated. moreover time, you fall deeper and deeper into a state of enchantment - even if it had been a bit of a dogged beginning two hours earlier and the high spirits took their time to arrive. 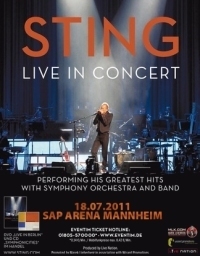 However, it appears that Sting had planned his concert with band and orchestra deliberately so. Finally, with the first beats of 'Every Breath You Take', there is no more holding back: It seems as if nearly all 7,000 visitors jump up as one man and rush towards the stage. With the charismatic 'Desert Rose' as the first encore, the entire SAP Arena becomes one rocking dance floor - and the audience shows that it can get excited after all. An audience, no doubt, that had been more or less quiet during the songs for very, very long. Just to acknowledge the artist at first with benevolent and then with more and more enthusiastic applause. That's only proper: After all, there is one of the greatest rock stars ever on stage. Behind Sting the Bochum Symphony Orchestra has taken its seats. With the load of their orchestral support he performed right from the start those hits that made him and his band Police superstars. Nevertheless, there still is some spanner in the works: It is a viable question whether a rock hit like 'Roxanne' actually requires an orchestra. By the middle of the first set it becomes evident why Sting clothed his songs into an orchestral robe: Because most (though, regrettably, not all) of them sound even better that way. Because songs like 'Russians', 'Englishman in New York' or the wonderful 'Fields of Gold' simply develop some extra magic with a symphonic arrangement. And because this combination of band, orchestra and Sting himself develops an immense power over the course of the concert that ends in some crescendo that couldn't have been expected from the start. Where others have failed, Sting succeeds: Classical and rock can form a marriage. At least a temporary marriage. It works because there isn't any doubt about who wears the breeches: At every point of the way, we are at a rock concert with a classical tinge, not at a classical performance with some rocking out. That is something the Bochum Symphony Orchestra obviously appreciates: It is simply amazing how they let themselves go, using the unusual musical freedom for pretty, at times cheeky solos - and enthusiastically clapping along. With 'Moon Over Bourbon Street' in the second set, everybody feels the performance is eventually becoming one great concert. Three songs later they rush in front of the stage, at last: And yet… Sting moves them.